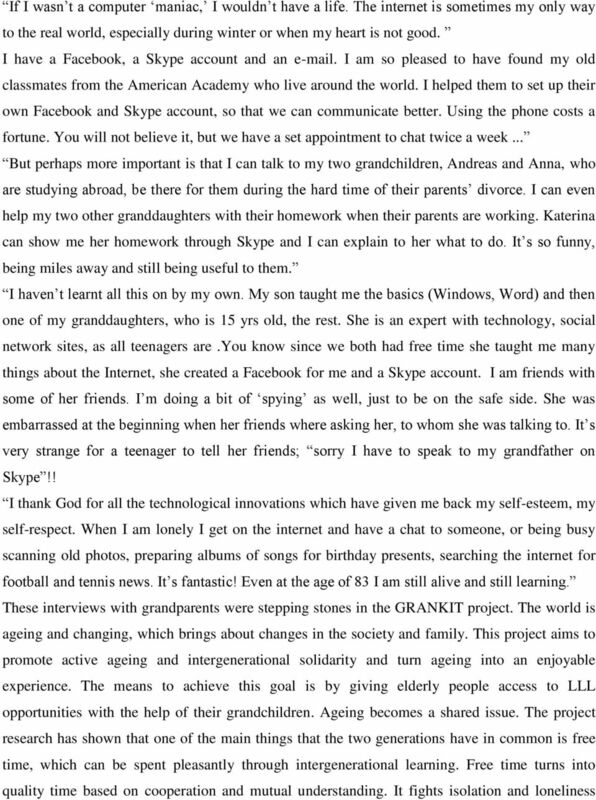 Download "THE GRANKIT PROJECT: AGE AND RECONCILIATION THROUGH INTERGENERATIONAL LEARNING"
2 of the third cycle (2017) are: 1. encouraging longer working lives and maintaining work ability; 2. promoting participation, non-discrimination and social inclusion of older persons; 3. promoting and safeguarding dignity, health and independence in older age, and 4. maintaining and enhancing intergenerational solidarity ( The most significant policy measure preparing society for rapid population growth is enabling and increasing older people s participation in the society and in the economy. This can be achieved by creating more age-friendly environments through active ageing policies which mobilize, encourage and empower the older population to utilize their full potential. Active ageing is the process of optimizing opportunities for health, participation and security in order to enhance quality of life as people age. It applies to both individuals and population groups. ( Active ageing allows people no matter the age to achieve their potential and to participate in society, while society is able to provide them with protection, security and care. In this light older people can remain active and contribute to the society s welfare a long time after they have retired from work. Active ageing will no doubt extend healthy life expectancy and quality of life for all people as they age. Ageing takes place within the context of friends, work associates, neighbors and family members. This is why interdependence and intergenerational solidarity are important principles of active ageing. 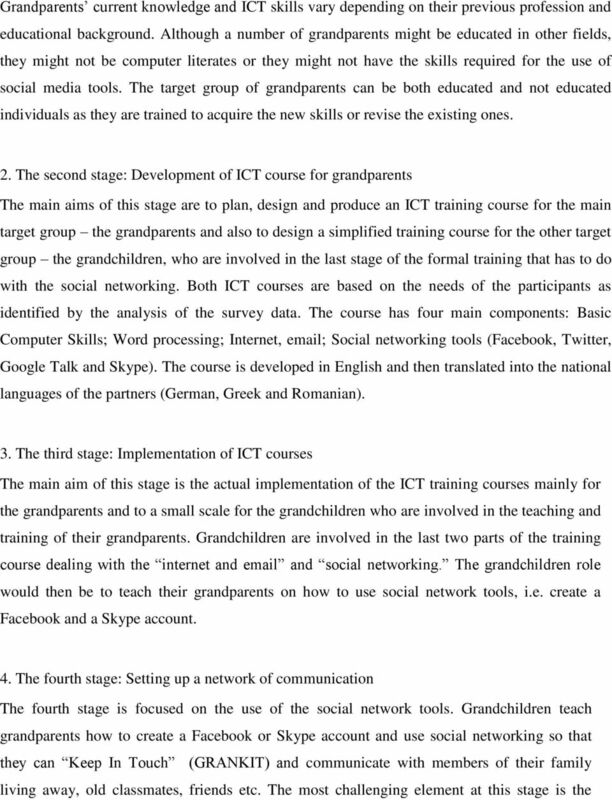 Project Rationale The GRANKIT project aims to promote active ageing and intergenerational solidarity through developing an innovative ICT training course for a special segment of older people, grandparents. The project helps grandparents acquire the necessary ICT skills in order to participate in the modern world, both for pleasure and for business. Grandparents are professionally trained in this field with the help of their grandchildren who use their current knowledge on social networking. Intergenerational solidarity has a final stage with the launching of the GRANDS HELP DESK on the web/platform where grandparents in their turn can offer support, help and guidance to children who are in need. 4 experienced by the elderly, engages young students in society by activating their citizenship qualities and, last but not least, strengthens family bonds. Project partners, target groups and objectives The project consortium consists of 5 partners who have the skills, knowledge and competences required to ensure the successful implementation of the project. GRANKIT project partners share a particular interest in professional development and cooperation in order to promote EU targets thus contributing to education development (The University of Nicosia, Cyprus, the University of Hannover, the Emphasys Computer Training, Cyprus, the EuroEd Foundation, Romania, the National Centre for Scientific Research Demokritos, Greece). 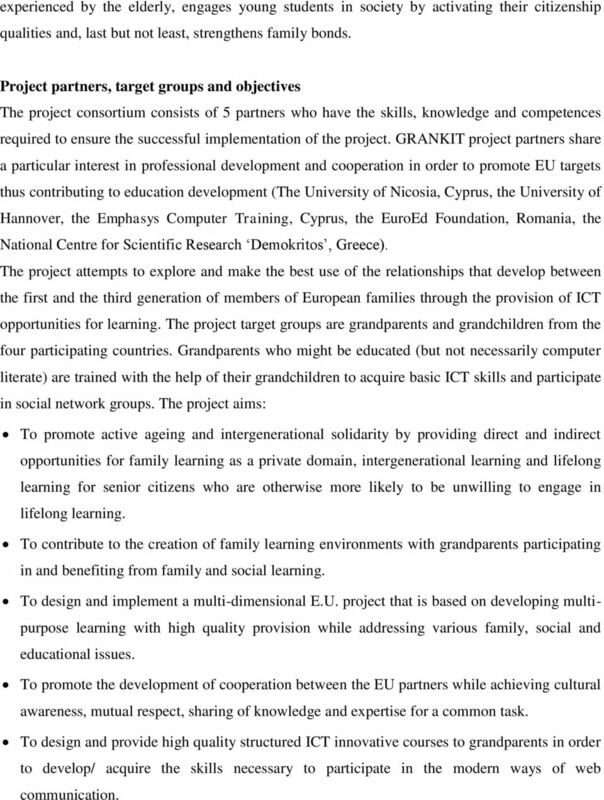 The project attempts to explore and make the best use of the relationships that develop between the first and the third generation of members of European families through the provision of ICT opportunities for learning. The project target groups are grandparents and grandchildren from the four participating countries. Grandparents who might be educated (but not necessarily computer literate) are trained with the help of their grandchildren to acquire basic ICT skills and participate in social network groups. The project aims: To promote active ageing and intergenerational solidarity by providing direct and indirect opportunities for family learning as a private domain, intergenerational learning and lifelong learning for senior citizens who are otherwise more likely to be unwilling to engage in lifelong learning. To contribute to the creation of family learning environments with grandparents participating in and benefiting from family and social learning. To design and implement a multi-dimensional E.U. project that is based on developing multipurpose learning with high quality provision while addressing various family, social and educational issues. To promote the development of cooperation between the EU partners while achieving cultural awareness, mutual respect, sharing of knowledge and expertise for a common task. To design and provide high quality structured ICT innovative courses to grandparents in order to develop/ acquire the skills necessary to participate in the modern ways of web communication. 5 To develop opportunities for specialized teaching and learning based on the transfer of knowledge and skills from one generation to the other. To investigate ways in which grandparents and grandchildren can communicate in the modern society with the aim of benefiting from each other. To improve the elderly people s quality of life by eliminating feelings of loneliness, isolation and inactiveness which many people of the third generation feel through their active involvement into social networking groups. To cast new light on our understanding of the relationships developed between grandparents and grandchildren. To provide opportunities for grandparents to get away from home and actively get involved in activities that will develop their social skills through learning. To promote volunteerism among grandparents/retired/elderly people with the aim of actively involving them in the lives of their grandchildren or other children. To set up a website GRANDS HELP DESK with the aim of providing support, guidance and help to children through the use of chat room, forum blog post and other social networking tools that will break the boundaries of each country. Methodology and main activities The project reflects a research cycle procedure where the steps are interrelated and interlinked. The Project is divided into five stages. 1. 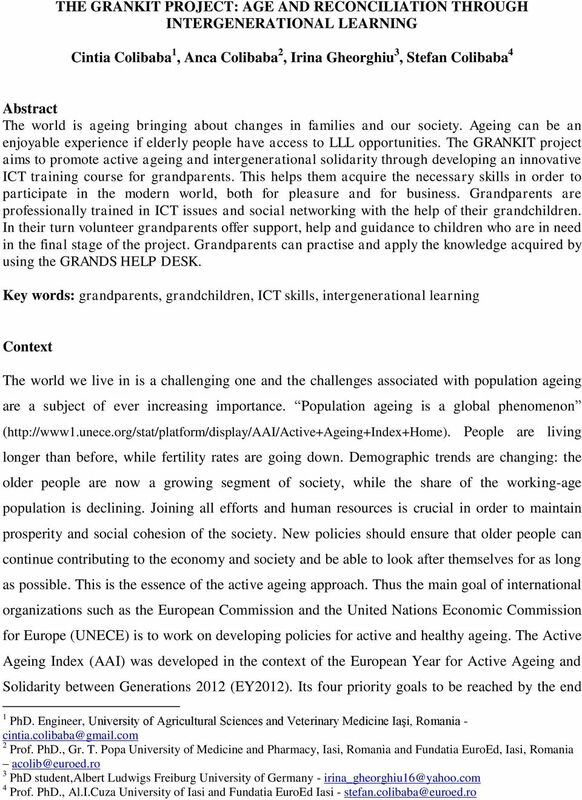 The first stage: Family learning issues and participants needs (survey) The research describes the issues related to intergenerational learning and active ageing with regards to the aspect of family learning as a private domain, within the European context. Through the use of interviews, observation and questionnaires (triangular methods combining qualitative and quantitative techniques) it identifies current ICT knowledge and skills of target groups who participate in this project, as well as related perceptions, views, relevant family facts that can assist the development of the project. 7 creating of a GRANDS GROUP, which enables participants to communicate with each other in order to exchange ideas, experiences, views and practice the skills acquired through the project. 5. 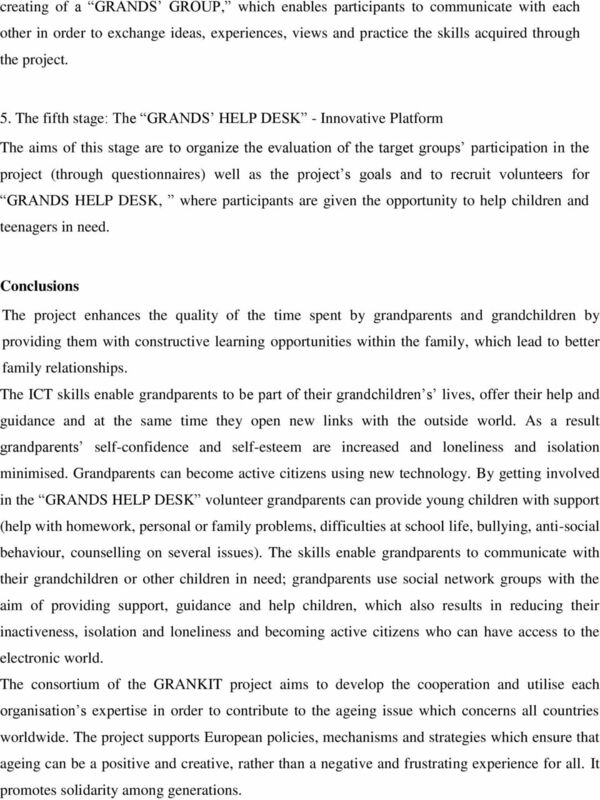 The fifth stage: The GRANDS HELP DESK - Innovative Platform The aims of this stage are to organize the evaluation of the target groups participation in the project (through questionnaires) well as the project s goals and to recruit volunteers for GRANDS HELP DESK, where participants are given the opportunity to help children and teenagers in need. Conclusions The project enhances the quality of the time spent by grandparents and grandchildren by providing them with constructive learning opportunities within the family, which lead to better family relationships. The ICT skills enable grandparents to be part of their grandchildren s lives, offer their help and guidance and at the same time they open new links with the outside world. As a result grandparents self-confidence and self-esteem are increased and loneliness and isolation minimised. Grandparents can become active citizens using new technology. By getting involved in the GRANDS HELP DESK volunteer grandparents can provide young children with support (help with homework, personal or family problems, difficulties at school life, bullying, anti-social behaviour, counselling on several issues). The skills enable grandparents to communicate with their grandchildren or other children in need; grandparents use social network groups with the aim of providing support, guidance and help children, which also results in reducing their inactiveness, isolation and loneliness and becoming active citizens who can have access to the electronic world. 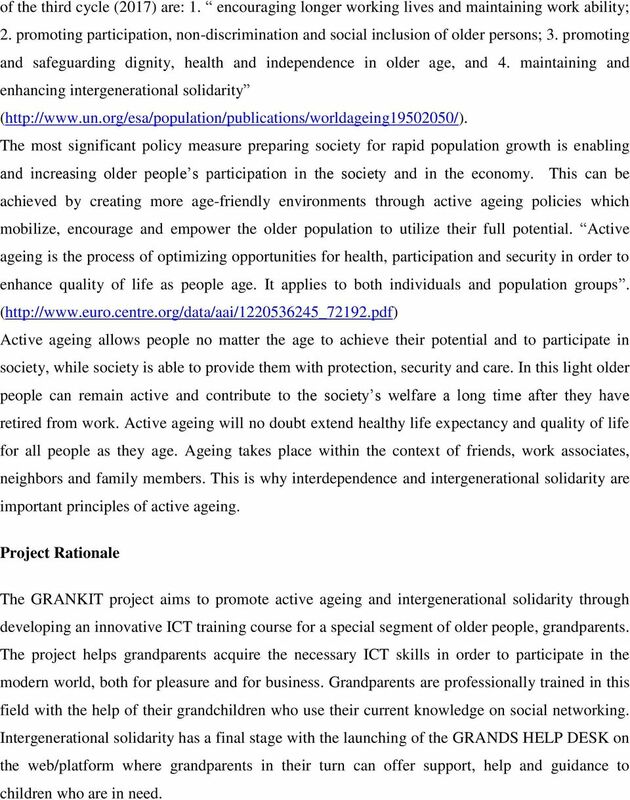 The consortium of the GRANKIT project aims to develop the cooperation and utilise each organisation s expertise in order to contribute to the ageing issue which concerns all countries worldwide. The project supports European policies, mechanisms and strategies which ensure that ageing can be a positive and creative, rather than a negative and frustrating experience for all. It promotes solidarity among generations. , 50, ,, 4, . "! 50 #. $. http://www.50plus.gr , 50 %., 50. 9! 2008, $ & ' & ( )! *+,# ) -, ) )., «" #$%; &" $" ' ", $(" " )("», /! 0 1, 23. $ $( + " MKO 50 " 1 4, +!# 2008 50, 50, (English introduction on page 9),, 4,,!,. "! 50 #. $. http://www.50plus.gr, 50 %.,!. 50. 9! 2008, $ & ' & ( )! *+,# ) -, ) )., «" #$%; &" $" ' ", $(" " )("», /! It is focused on prevention and health promotion, integrated care & active and independent living for older persons. The Official Newsletter of Projects Abroad Bolivia www.projects-abroad.net January 2014 1 Hi all, Carmen Herbas Country Director Welcome to the January edition of our Newsletter for Projects Abroad Bolivia. Around 15,500 Kirklees residents in their 60s are working and are likely to retire from work in the next few years. This is what we think. Young people experiencing poverty talk about their lives 1 in collaboration with 2 What Do You Think? wants to give a voice to vulnerable children. Through its What Do You Think? Future Solutions from Qualitative Big Data Healthcare Analytics Conference 2014 Dr Avnesh Ratnanesan (Avi) CEO, Energesse Leading Innovation in Healthcare and Wellness Agenda 1. The Health Ecosystem 2. The Impact of Cultural and Citizenship Education on Social Cohesion. 3 5 December 2009 Vilnius, Lithuania European Capital of Culture 2009. The Interview Series - Presented by SmartFunnel Interviews of Sales + Marketing Industry Leaders Louis Gudema: Founder and President of Revenue + Associates PETER: Hello folks this is Peter Fillmore speaking.